Michelle Nova is a Dramatico Spinto Soprano, singing teacher, Principal of La Nova Studios and Director of La Nova Singers. Michelle began choral singing at the age of 14 and commenced her voice training in Dorset at the age of 22. She later went to London to further the voice, studying the Bel Canto and General Italian technique with an independent singing teacher and has also received training at the Royal Opera House, Covent Garden and Opera 80. She became a founder member of Floral Street Opera, which was formed as a training company for young opera singers. 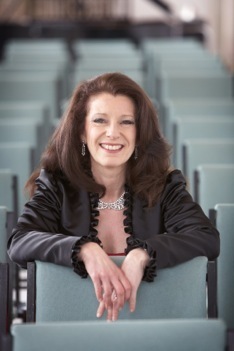 Michelle has given recitals and concerts across the UK, Ireland, America and Guernsey since 1992. In addition, her career has seen her give a one-hour live broadcast on Classic FM, and interviews on BBC Radio and Hope FM. As well as her performing, Michelle has worked with children in Ireland, London and Dorset aged from 8 to 16, giving workshops in singing and performing. She formed and ran the Casterbridge Youth Opera, directing them in performances including The Fire Maid, Pirates of Penzance, The Snow Queen, Persephone and E. Humperdink’s Hansel and Gretel. An article written by Michelle on ‘The Importance of a Good Vocal Technique’ was published in the national magazine of the Musicians Union. Michelle has been invited as a Festival adjudicator, choral conductor, vocal facilitator and has become a highly respected teacher. She now gives Master-classes and technical workshops in Bel Canto and General Italian technique. You can find out more about Michelle on her own website, http://www.lanovastudios.co.uk. If you’re interested in singing lessons in Bournemouth, you can contact her directly at michelle@lanovastudios.co.uk.